It was not until 1895 that Set III of the English Lyrics was published. 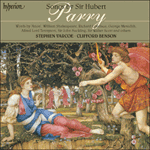 Its dedicatee, Harry Plunket Greene, was the most sought-after baritone in Britain, having made his name in 1892 with the role of Job in Parry’s hugely successful oratorio (recorded on Hyperion CDA67025). A few years later he was also to become Parry’s son-in-law, marrying Gwendolen, the composer’s younger daughter. Set III was the first collection of songs in which lyrics by recognized masters were mixed with poetry by Parry’s immediate contemporaries. The two poems by Richard Lovelace appear to have been written as a result of incarceration during the English Civil War – To Althea in 1642 after he was thrown into the Gatehouse prison, and To Lucasta, on going to the wars in 1648, after being jailed as a prominent Cavalier by the Parliamentarians. To Lucasta is all about the greater imperative of honour in the face of war. The sentiment elicited a sturdy response from Parry in which his distinctive use of diatonic appoggiaturas and robust suspensions (redolent of Blest Pair of Sirens) are conspicuous. Thomas Lovell Beddoes’ play Death’s Jest Book (published 1850), and more specifically the ‘Dirge’ from Act II Scene 1, sung over the dead body of Wolfram, was the source of If thou would’st ease thine heart. This is a fine example of one of Parry’s numerous modified strophic designs where both verses share some of the same material, yet an appreciable proportion of the variegational process is dictated by the changing sentiment of the lyric. The text recommends sleep as a comfort to the suffering of love, but only death is the true remedy. For such an anguished scene Parry makes much play on the contrast of poignant appoggiaturas in the piano with a more languorous melody in the voice. Even more resolute than To Lucasta is To Althea, where Parry sets three (of the four) verses of Lovelace’s lyric in ABA form. This structural decision enabled the last verse, with its familiar words ‘Stone walls do not a prison make, Nor iron bars a cage’ (marked, somewhat characteristically, meno mosso and largamente), to have as much musical and literary impact as possible. This is also very much enhanced by the distinctive preludial material that punctuates the verses. No 4: Why so pale and wan? Only the day was there. Through the Ivory Gate was almost certainly written as a result of the appearance of Julian Sturgis’s A Book of Song in 1894, a year before Set III was published. It is without doubt one of Parry’s most original creations for, in essence, it is more of a miniature scena rather than a song. From the narrative of Sturgis’s poem, which recounts in a dream an encounter with a dead friend, Parry constructs a dialogue between voice and piano. The style is part declamatory, part arioso where the piano often provides the thematic continuity as if it were an orchestra manqué. Particularly fine is the material that follows the piano’s impassioned climax (‘Then answer had I made’) where the sense of tonal control, the tangential restatement of the opening idea (‘So with closed eyes I lay’) and the wistful final gesture (‘Only the day was there’) are handled in masterly fashion.